The first Twitter Community adopted a Nurph Channel in the Summer of 2013. Since then Nurph has continued to grow with more communities, more chats, and more tweets being published every month. In fact, @ReeceMastin even turned #Nurph in to a trending hashtag across Australia earlier this year. Along the way some of Nurph's Communities have been hosting Google Hangouts alongside their Twitter Chats. This combines the engagement of live video with the networking effects of Twitter. But this dual delivery approach makes for a convoluted experience for the participants; they have to have to jump between a Google Hangout in one browser window, and a Twitter stream in another -- and this makes it hard to keep track of the conversation. Why should you have to leave the Twitter World to watch or participate in a Group Video Chat experience? Nurph's new Group Video Chat for Twitter bridges the divide between Google Hangouts and Twitter Chats for the Twitter Communities who run a Google Hangout and a Twitter Chat side-by-side. This offers an incredible new opportunity for sharing and recording knowledge. Just imagine a tutor hosting an online course through their Nurph Channel with a group of students. Each each session can be recorded for people to review and share even after the session has ended. Not just as a solution to Twitter + G+, it seems like a better alternative to #meerkat, if I may dare to suggest. @Nurph is a marriage of Hangouts and Twitter chats. 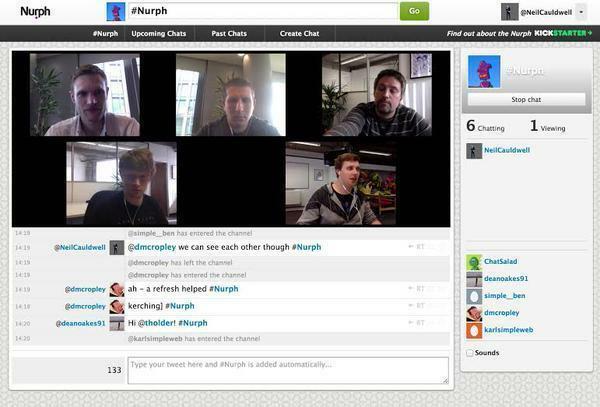 Nurph is basically group meerkat... multiple video participants and group chat. its pretty fantastic. Love it- this is such a stellar format with the chat right below the video! I feel like this is exactly what @Huffoto and I talked about meerkat lacking in. The Speak & Tweet microphone will enable you to chat away freely in a Nurph Channel and to have your speech automatically converted in to tweets -- "Shweetness! I'm luv'n that -- @jameseasterling". 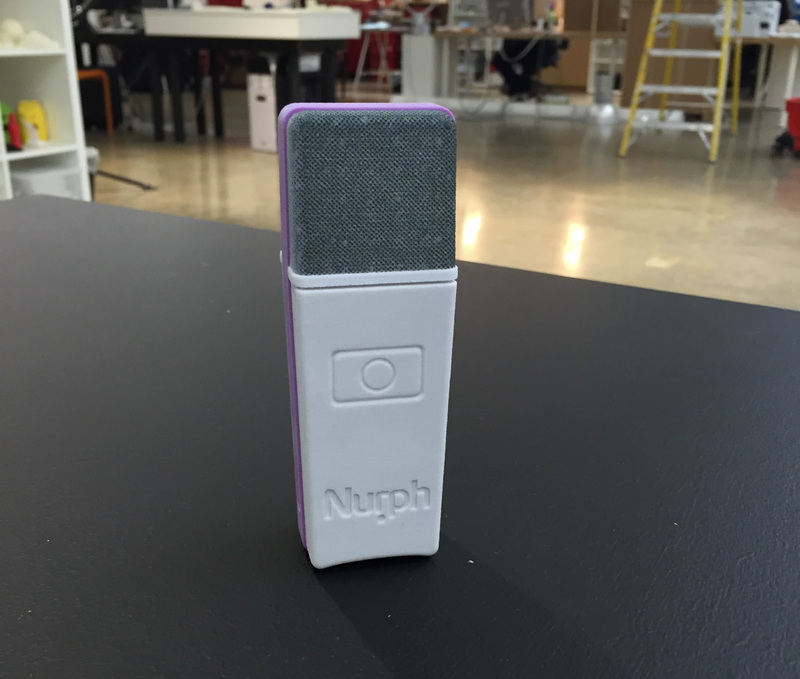 Follow @Nurph on Twitter for more news about the Speak and Tweet microphone soon. We hope you'll enjoy using Group Video Chat for Twitter and look forward to chatting with you in the Nurph Channels. We'll have more news and innovative new Twitter technology for you soon. @Nurph's Big News -- Angel Funding, Next-Gen Nurph, Microphone! Nurph closed it's first angel investment back in 2010. Another, smaller angel investment was closed in early 2014. And in the meantime the platform has been adopted by top companies like UPS, Xerox, & Buffer, and hundreds of Twitter Communities, to publish tens of thousands of tweets-per-month. And the feedback is incredible. Today we're announcing that Nurph closed a third round of angel funding and is developing two incredible new products -- a "Next-Gen Nurph" that will revolutionize Twitter Chats, and a "Speak & Tweet" microphone that will tweet what you say. The company closed a third round of funding, with UK-based angel investor Ravi Lal-Sarin leading the round. The round has been in the works since late 2014 and the paperwork finally closed this month (March 2015). Now we're working away on the Next-Gen Nurph and expanding the team in preparation for the upcoming Kickstarter campaign. So far the Nurph platform has been built for text-based Twitter Chats. Twitter Chats have been around for years, but only a small proportion of Twitter Users participate in them, and in their current format they've reached a plateau. But there's huge potential there for creating real-time group conversations for niche, local topics, all the way up to highly followed, A-list celebrity chats. Twitter Chats need to be taken to the next level. These new features will turn the Nurph Channels into Online Talk Shows, with a host and several guests streaming live on video, and an unlimited number of Twitter Users fulfilling the role of a studio audience. The audience will be able to interact by Favoriting and Retweeting the guests' comments, as well as tweeting in their own questions via the Channel #Hashtag. We're announcing a partnership with @SimpleWeb who will be working on development of the video streaming layer of Next-Gen Nurph. Further to this, Nurph is launching brand new hardware to complement "Next-Gen Nurph". Dubbed the "Speak and Tweet", it's a wireless microphone that will connect to your smartphone to transcribe & tweet the things that you say. We recently received the first 3D print of the microphone, produced by @Digits2Widgets. Nurph has teamed up with @BenPerman, designer of Twettle, (as seen on Wired) for the 3D renderings of the Speak and Tweet. Nurph is launching a huge Kickstarter campaign as vehicle for the "Twitter Chat Revolution". The campaign will encompass the launch of both Next-Gen Nurph and the Speak and Tweet microphone. Want to be the first to know about the launch? Subscribe to the newsletter. It's an incredibly exciting time for Nurph. Stay tuned for more news soon, and I look forward to seeing you Nurphin' it up in the Nurph Channels! 2014 was a fantastic year of growth for Nurph, and it's time to share the amazing progress that was made throughout the year. Key metrics are growing year-on-year by up to 2,102%, "to Nurph" is appearing as a verb in tweets, highly regarded companies have hosted chats, and much more. Year-on-year, the number of chats grew by 2,102%, tweets published by 615%, and Nurphers by 330%. "Nurphers" are the number of unique Twitter Users who both log-in AND participate in a Twitter Chat via Nurph throughout the year. In October 2014 we reached a yearly peak of 36,000+ tweets published for the month, which is almost as many as the number of tweets published by Nurph throughout the whole of 2013. Now there are 225 Nurph Channels with chat sessions recorded on them (think of these as Nurph Channels that have been "inhabited" by Twitter Communities), some of the chats have had 600+ Replays, and #STLChat reached 1,000+ Replays for an individual chat. 22/04/14 -- Are You in the Nurph? Update: Huge News for 2015! @corecorina: @Nurph works extremely well for Twitter Chats... my new fave place. @425suzanne: we have 40 people in the @nurph chat. This is awesome. @jessryanco: can I just say I LOVE @nurph for Twitter chats?! What a great tool! @CBarrows: this is the second time I've used @Nurph and I'm starting to love it. @Beymour: @Nurph Where have you been all my life?! In fact it was tricky to pick just a few tweets to include, and it barely tells the full story. That's why we've created "Year in Tweets 2014" to highlight a further sample of the feedback Nurph received in the year. Check it out. 2014 was fantastic for Nurph, but we're going even bigger in 2015. More chats, more tweets, and a huge KickStarter campaign to help raise awareness and further funding for the exciting Nurph plans. You're going to love it! In 2014 Nurph received some very kind tweets from the Nurphers. Here is a sample of some of the tweets on a month-by-month basis. Thanks for the kind tweets, everyone! @PrintChampion: Just trying nurph for the first time. Love it. @sandyhubbard: Favorite tools: @buffer, Dropbox, Photoshop, and the AMAZING..
@mariaduron: Browse, search & watch past chats....really! @PrintMediaCentr: @Nurph OK.. that is amazing!!! @CoronaTools: I'm so excited I'm tweetless!! @amysbassett: It's totally awesome! Just what we needed. @corecorina @Nurph works extremely well for Twitter Chats... my new fave place. 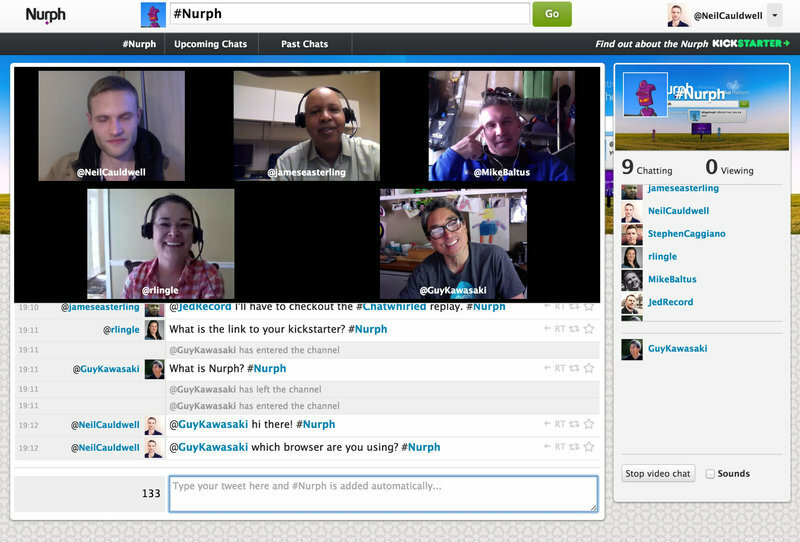 @kikilitalien: Nurph has been phenomenal for Association Chat participants! @sprout_sarah: It's been my favorite Twitter chat tool recently. @BeckyMcCray: @nurph is my new favorite Twitter chat tool. @GeraldMoczynski: Arrrrgh. Tweetdeck is fighting me. Thank God for @Nurph! @emilymiethner: Best tool I've used so far. Rock! @T4Leonard: @Nurph makes this so much easier!!! @PSGCNJ: You help make #Twitter efficient and effective. @Karen_C_Wilson: I'm really liking nurph for twitter chats! @ancestryjourney: Oh, Lacey, I really, really like this. @WatkinSBS: Nurph rocks, wish I found this platform sooner! So easy to chat. @AmyCCosper: @Nurph fancy guitar riff right there. and, nice accent! @ancestryjourney: credit goes to @mslaceyloo for letting us all know about it! @Catenabi: Ummmm.. this @nurph thing is awesome! @RylSocialMedia: Omg, get up in there. Your life is about to change. @jenzings: Yes, nurph...this is a first for me. Impressive. @wisegoldfish: Wow @Nurph makes everything so much easier!!! @vegecomgirl: love @Nurph! Cannot recommend it enough. @michdzl: did you get on Nurph yet? SO MUCH EASIER!! @yogadaemon: loving #pantrychat, any chance you could host through @nurph? @Tuism: Testing testing, one two three, damn this @Nurph thing is pretty nifty! @sandyhubbard: @Nurph is such a spectacular experience. @WellmanWilson: try out @Nurph - it's awesome for twitter chats! @doran_jenna: Where has this been all my life?? @EmmaCunningham: Nurph is amazing! Could not make it through these without it. @ValsRoots: using http://nurph.com...I like it. Much easier for me to keep up! @SteinatDavis: @Nurph Both outstanding. Nurph from now on! @PrintMediaCentr: Join us through @Nurph - it makes tweet chats rock! @heylisarenee: I absolutely adore this Nurph situation. FYI. @sandyhubbard: ...a place where I can watch the #printchat replay in REAL TIME! @staciewalker: I love your Twitter chat platform. @KaylynnCrumb: ...using Nurph and not going through Twitter. I love it already! @vegecomgirl: "It feels warm & intimate when using @Nurph"
@DomGarrett: Isn't it so nice? @JoshHirsch1: I've tried out a bunch and nothing beats it. @Tampaag: go to http://nurph.com/treechat for easy following, I love it! @DomGarrett: @Nurph Just letting you know that I think you rock. @Techmonious: Just became a HUGE fan of @Nurph Being able to replay/fast forward twitter chats is AMAZING!!! @BethAnnesBest: Nostalgia Chat is on Nurph I love nurph! @TeriMKojetin: @Nurph is really the best Twitter chat platform around. @theverdevegan: @nurph -- Really the best way to tweetchat! <3 Love it. @DomGarrett: Hosted on @Nurph, so you know it is good. @ChristinKardos: My first of these chats....also first time using @Nurph - loving it. @claybow: I'm totally digging @nurph. Great solution. @ceQuilibria: So glad this chat is on @Nurph - it really is the easiest way to chat! @jessryanco: Nurph is way easier to manage chats than Tweetdeck! @niclas_marie: Yes, yes you do!! You don't know what you are missing. @sandyhubbard: It enhances our chat experience and increases engagement. @McMuckers: Love this @Nurph ... so easy to follow what is happening. Brill. @EdTechnocation: I love how @nurph shows you who's in the chat! @FettleVegan: Love using @nurph for these #Vegan Chats! @NathanStrum: Nurph is where it's at, Brad. Welcome to the winners circle. @AndHeGames: It makes things way cooler. @MrsPageTurner: ...made things easy to follow! @webport_global: chat from Nurph is so easy! I am ready! @GlynisAstie: Thank you @Nurph for making Twitter chats sooo much easier. @christybrenn: Totally wowed by @Nurph for replaying a twitter chat! @ErynThLibrarian: ...maybe now I can #edchat without losing my mind! @VeganFitnessCom: Makes keeping up with Twitter chats so much easier! @ChristinKardos: @Mark_Markets I'm totally a @Nurph nerd. @HeatherCooan: ...it's way cool we should use it! @ancestryjourney: I use Nurph exclusively now for the chats. @EmmaCunningham: ...Nurph is so superior I'm sad that a chat doesn't use it. @plemmonsa: Loved using @Nurph for #tlchat last night. @EMomNowCalgary: ...Your chat replay option is pure genius! @jluss: Loved using @nurph too!!! Thanks for that tip! @NikkiDRobertson: ...for Twitter chats @Nurph knocks the socks off everything else! @DomGarrett: I use @Nurph for just about all of my chats. GREAT platform. @EagleEyedEditor: A1: Canva and Nurph. I'm enjoying both very much. @KFoleyConsult: First time using @nurph during a chat... WHERE HAVE I BEEN?!!? @KFoleyConsult: Everything I need in one place. Hooked already. @kevinttully: It's pretty awesome, isn't it Kathryn. @et_vanek: This is my first time using Nurph. Love it! @movystream: Sooo much easier, i love it! @APGovME: I think you shouldn't be allowed to hold a Twitter chat if it isn't on @nurph! SOOOOOOOOOOOO much easier! @niklasjblixt: Thanks for the tip @Wicked_D works a lot better with Nurph! @ThinkSEM: Last week I learned about Nurph. Peeps say it's the bomb. @Beymour: On a side note, this my first time using Nurph -- really great tool! @TeriMKojetin: The best platform for participating in our chat is @Nurph! @JerryDugan: @nurph made #dadchat much easier to follow. Thanks. @tylerrobb: ..@Nurph is really cool! Twitter chats seemed overwhelming before. @Tampaag: Yeah, I see you in Nurph land! @movystream: @EmmaCunningham @Nurph Seriously, same. Life changing. @mauilibrarian2: Five Apps Enchanting Apps in 2014: @Canva @Nurph @Flipgrid..
@ChocLitSaturday: nothing compares to #Nurph! Wicked happy! A big thank you to all the passionate Nurphers who tweeted kind words about Nurph throughout this year. It's fantastic to see Nurph improving your Twitter Chat experience! @Nurph's Update: Huge News for 2015! Hi Nurphers! We have some very exciting news for you. 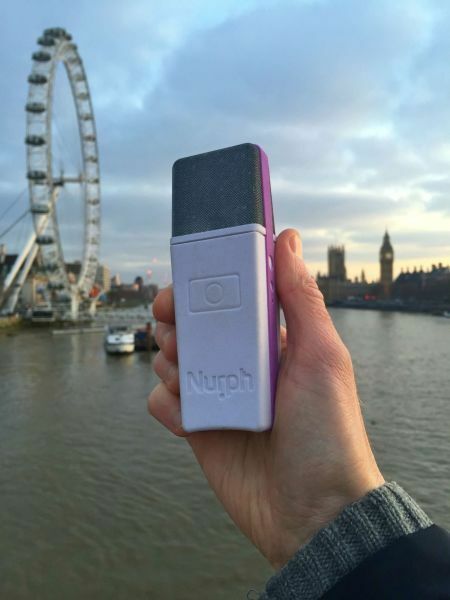 In 2015 Nurph is launching a huge KickStarter campaign! Nurph LLC has been incorporated in the US to facilitate some of our goals for 2015. We can't wait to tell you more about this. Nurph is lucky to have three new Brand Ambassadors on board! Please meet & tweet @vegecomgirl, @TeriMKojetin, and @EmmaCunningham who join @MariaDuron as Nurph Brand Ambassadors! Got a question about using Nurph for your Twitter Chats? The Brand Ambassadors are the experts! The positive feedback continues! Thank you for all the kind tweets. @DomGarrett: ...I use @Nurph for just about all of my chats. GREAT platform. @SocialPiq: ..check out @Nurph. It's the best tool we've used for the job! @JoshHirsch1: Use @Nurph. You can't go wrong. @EagleEyedEditor: ...Nurph really made it easy! Think I'm in love with them. Nurph has come a long way in 2014, and 2015 is going to be even more exciting for Nurph and the World of Twitter Chats! Stay tuned for more news in early in 2015. @Nurph's Up: 21/11/2014 -- Best Tool for the Job! @Nurph said: Thanks @SocialPiq for this kind tweet about Nurph being a good tool for Twitter Chats! @Eggdough said: @Nurph and just think of all the improvements we have on the way for the Nurph Channels! #LitChat: Is the Internet Making English Better? #SMXChat: How Do Corporations and Brands Make the Best of Social Media? #Nurph: Should you start a Twitter Chat? #PrintChat: Taking Print SKY-High for Skyplex! #VeganFoodChat: That First-Ever Vegan Thanksgiving! Have you started tweeting the archives to your Twitter Chats yet? @anaredmond: @TeacherTabitha @katyamuses @mr_isaacs I did it a few weeks ago. Was fun. They're very supportive. Definitely use nurph - easier to follow. @Nurph said: Have you changed your Twitter Chat game yet? Get in the Nurph! Thanks @QBOSarahK! @Eggdough said: @Nurph it's game, set, and chat! #SMXChat: Release the energy of your social community. #Nurph: What is the best day of the week for a Twitter Chat? #mufuchat: How do you help your MuFu students to succeed at KS4? #edtechbridge: What role does social media have in developing collaborative relationships? Check out Nurph's very own video tutorials & tips for hosting Twitter Chats! @movystream: @Christine_Chen6 Sooo much easier, i love it! @Nurph's Up: 07/01/2014 -- Love It! @Eggdough said: @Nurph hopefully @EagleEyedEditor is referring to Nurph as a platform rather than you specifically. @Nurph said: @Eggdough don't pretend you don't feel the same way. #SMXChat: Is Your Social Marketing Reaping a Bountiful Harvest or Dying on the Vine? #Nurph: How often should you host a Twitter Chat? #mufuchat: What are the benefits of singing for our students? Are you "Nurphing"? Check out Nurph as a verb! @JonReifler: @StacyKildal Like the #QBShowLive...May need to recruit @Nurph, but enjoying the @QBShow live on Twitter. @MrJereRich: You should check out the new chatroom for @NeriumIntl by going here:http://bit.ly/10mUXO9 . Our #NeriumRealChat is going on now.